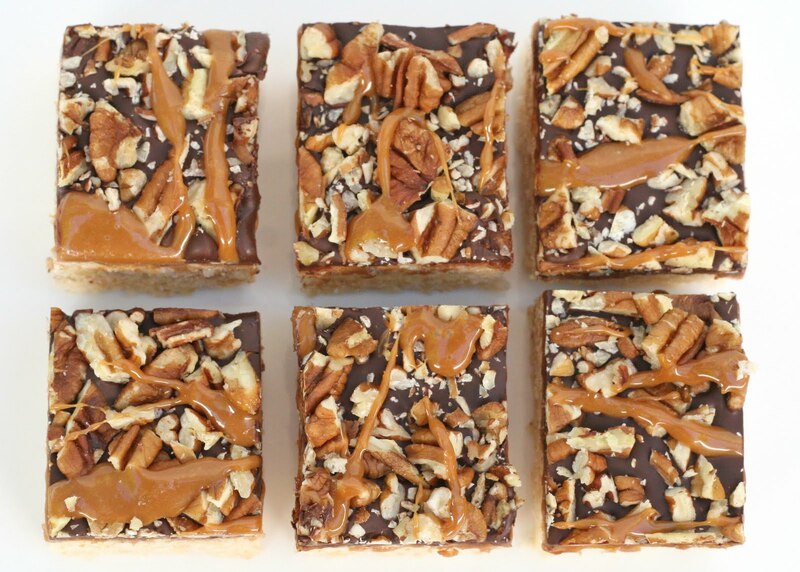 From the top, you’d never know that the delicious looking, chocolate and caramel desserts above are humble rice krispies treats! 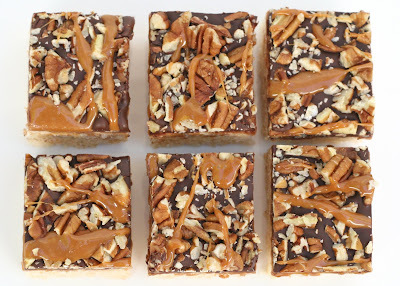 Well, once humble rice krispies treats… now elevated to a delicious, decadent dessert! 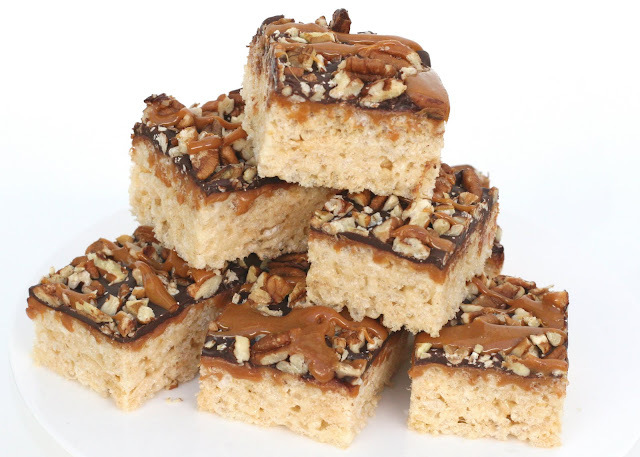 I’ve been playing with a few ideas for dressing up rice krispies treats, and this is one of my delicious successes! Prepare Rice Krispies Treats as directed on cereal box (so you need Rice Krispies, marshmallows and butter). Spread into a 9″x13″ pan (as directed). In the top of a double boiler, melt 3/4 of a pound of store bought individual caramels (Brach’s brand works well), along with 2 Tablespoons of water and 1/2 teaspoon of vanilla extract. It will take about 10 minutes to melt everything together. Stir as needed. Pour the melted caramel over the prepared Rice Krispies treats, reserving a small about of caramel in the double boiler (that will be used on the very top as decoration). Spread caramel evenly over the Rice Krispies treats. 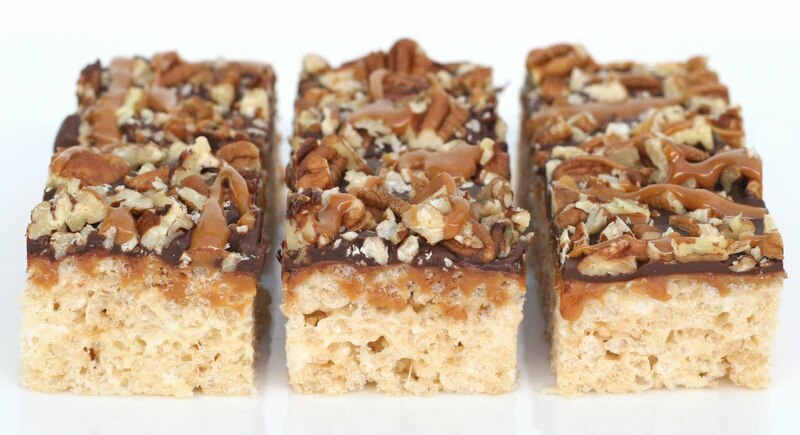 Place the whole pan (of caramel topped rice krispies treats) in the fridge for about 5 minutes. Melt 6 oz. of semi sweet chocolate in a bowl in the microwave (in 30 second intervals). When almost melted, remove (carefully) from microwave, and stir until smooth and fully melted. Remove rice krispies treats from fridge, and spread melted chocolate over evenly. Top with 3/4 cup chopped pecans. Warm the remaining caramel (that was reserved in the double boiler) and then drizzle caramel on top of pecans. Place the pan (of rice krispies treats) in the fridge or on the counter (in cool weather) until the chocolate has set. 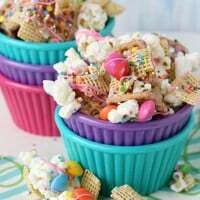 Yum, have been thinking about using Rice Krispie Treats on something soon and these have given me a few good ideas. Oh wow, these look divine! This will sure become a family favorite… Thanks, Glory!! Can you believe I still haven't tried rice krispie treats…lol. I might give them a try after all. I have some caramel and was looking for some treats I could use it for. They look delicious and I like the crunchy look too. Dear Lord, those look like the most trouble that a rice krispie could ever get into. YUM. Yum does NOT do this post justice! lol……I am definitely adding these to my MUST MAKE list! 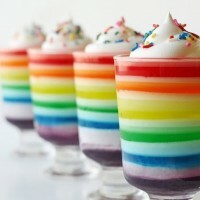 These look delightful!! I am going to use them for a super fun fall dessert table. Now I know what I'm going to make for the bake sale at the school carnival. These look so super delicious–gonna have to make them during my next chocolate craving episode! Great recipe and the common response was the bars are insane! A very good thing! SERIOUSLY!?! These look unbelievable! Can't wait to take a bite! Yummy!!!! I made these for trivia night and had people from other tables asking for one!!!! They were a perfect twist to Rice Kripie Treat!!!!! These are definitely a grown-up version of the classic rice krispie treats! They look fantastic. Glory these are gorgeous! 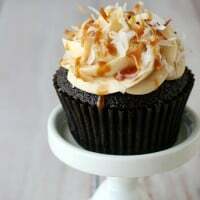 Anything with caramel and chocolate and I am all in! These look great! You know how I love a krispie treat! These look great and I’m sure they’ll taste great, however, it actually took at least 1/2 hour to melt the caramels and I used a whole bag of chocolate chips. I started with the 6 oz and it looked like a smear of chocolate, not at all like those pictured above. 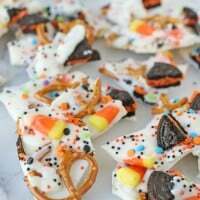 These look sooo delish. I have a church gathering, on the beach, in August and these are going to be my contribution to the dessert table.